Apothecia 0.5-1.0 mm broad, sessile, at first urn-like, centrally concave, becoming cushion-shaped to discoid; hymenium glabrous, bright yellow to citrine, slightly translucent; exterior colored like the disc or paler; margin more or less even, lacking hairs; context soft, fleshy, yellowish; odor and taste not investigated. Spores 8.0-11.0 (13.0) x 2.0-2.5 µm, narrowly ellipsoid to subfusoid, occasionally curved, hyaline, one-septate at maturity, some with droplets; asci eight-spored, uni to biseriate, the tips inamyloid. Bisporella sulfurina is a tiny, lemon-yellow discomycete unusual in that it fruits in close association with a pyrenomycete. The latter is recognized by a layer of blackish tissue found in close proximity to the brightly colored discs. 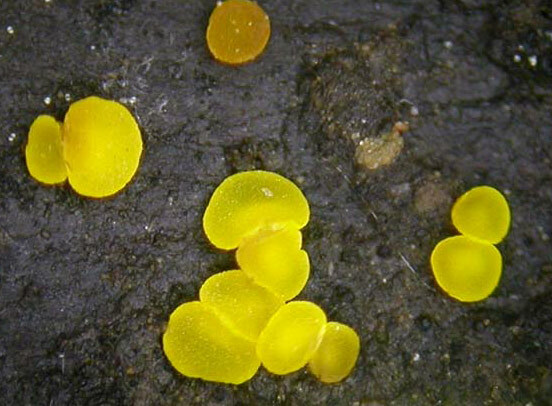 Bisporella citrina is a common, larger species, not associated with a pyrenomycete. It typically fruits gregariously rather than clustered on bark-free hardwoods. 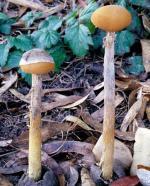 Both species have two-celled ascopores at maturity, but the spores of Bisporella citrina are distinctly broader. A third Bisporella, B. pallescens, forms small, whitish cups on hardwoods, and like Bisporella sulfurina, fruits on the surface of another fungus, a conidial forming taxa called Bispora antennata.